Have you ever bought something at a home decor store and absolutely loved it? But then a couple years later you realize that it's not your style anymore, you don't like that color, and it doesn't really match the rest of the room? I bought this clock at Pier1 or Ross (eek, I can't remember which!) almost 10 years ago and it was an amazing deal. I also liked that it was a really unique shape. But now the color and finish does not work at all in my modern bohemian master bedroom. 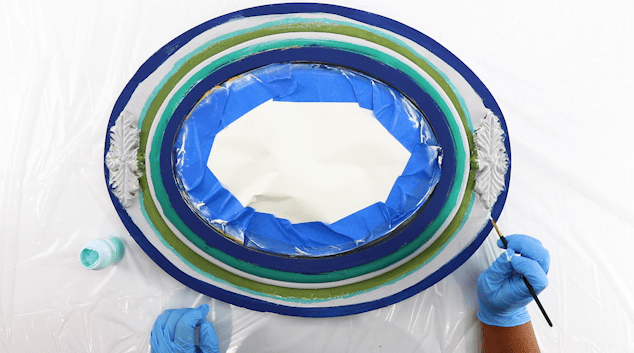 Today I'm going to share a really easy technique for changing the color and design on a home decor piece with paint. 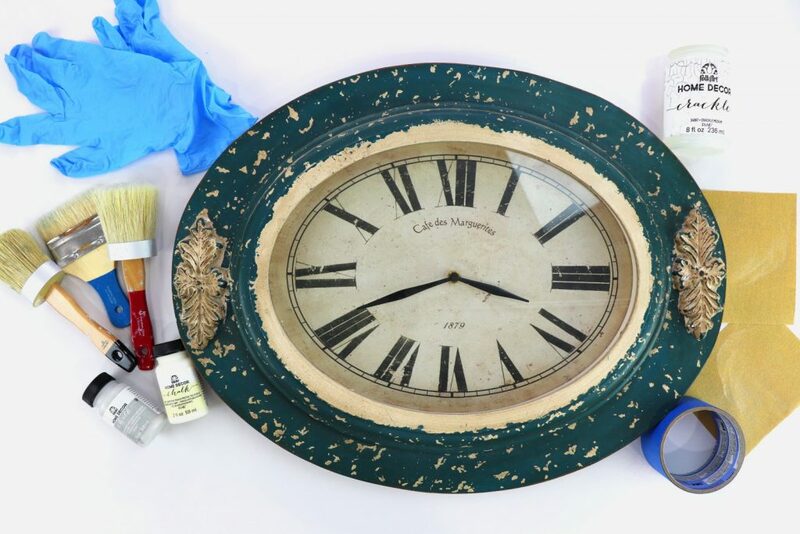 You can use the same technique on anything, not just DIY bohemian wall clocks. This year my husband and I decided to redo our master bedroom. This clock was on the wall closest to my side of the bed and it's what I would look at when I first wake up in the morning to see what time it was. This year when we repainted the walls we took everything down and I realized that our new room design has a lot more clean lines and modern patterns in it with a touch of bohemian style. 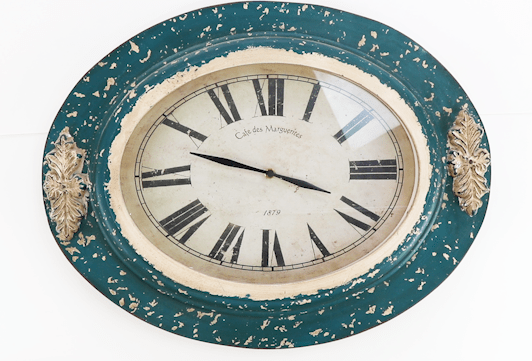 This really distressed, very textured finish wall clock was net definitely not going to fit in with the rest of my decor. I needed to make a change. The clock sat out in the garage for a couple of months as it got mixed in with our garage sale stuff. Every time I looked at this clock, I loved the shape but I could not stand the finish and the color that it was. It just made my skin crawl. It kind of feels like popcorn ceiling! And as I thought about what I could do with the clock to make it match the decor I realized that the distressed face of the clock was definitely never going to work in my room again, paired with this frame. I needed a fun design, with brighter colors and an almost bohemian feel. Here's the thing that's really great about projects where you don't know how it's going to turn out; if it looks really bad, you can always take some sandpaper to it and start over again. So I asked my daughter if she would paint this clock, knowing that if we didn't like the design, we could just start over again. I gave her some pale grey chalk paint, ivory chalk paint, and crackle medium. 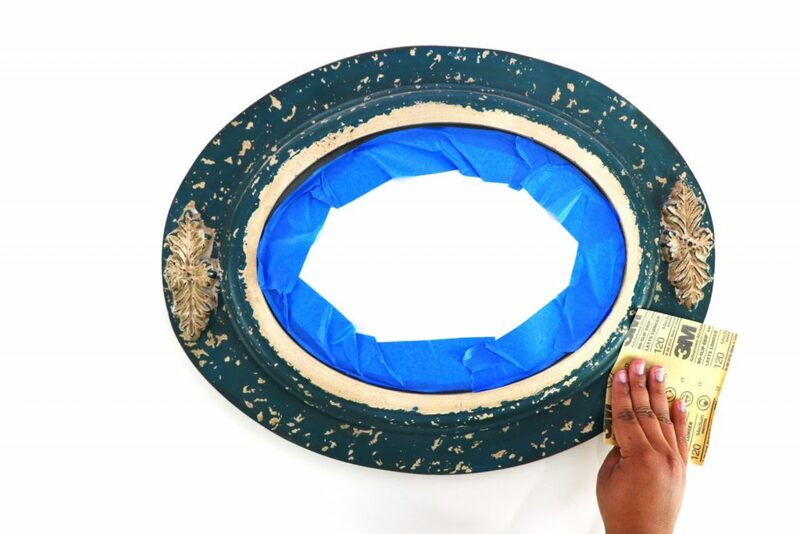 You can use whatever paint you have on hand to make this project. The first step was to sand off as much of the previous texture as possible. This was to prep the surface for paint but also to take away the texture that made my skin crawl. Next she painted on a base coat of ivory chalk paint. The color that you want to show in the cracks is the color that you always need to paint first when you're using crackle medium. Allow that to dry and then paint on a layer of crackle medium. Follow the directions on the crackle medium for the next step. If you want big cracks, paint the crackle medium on thicker. My daughter told me that she painted the crackle medium on a little bit thinner than she had anticipated so this crackle effect is very subtle on this wall clock. 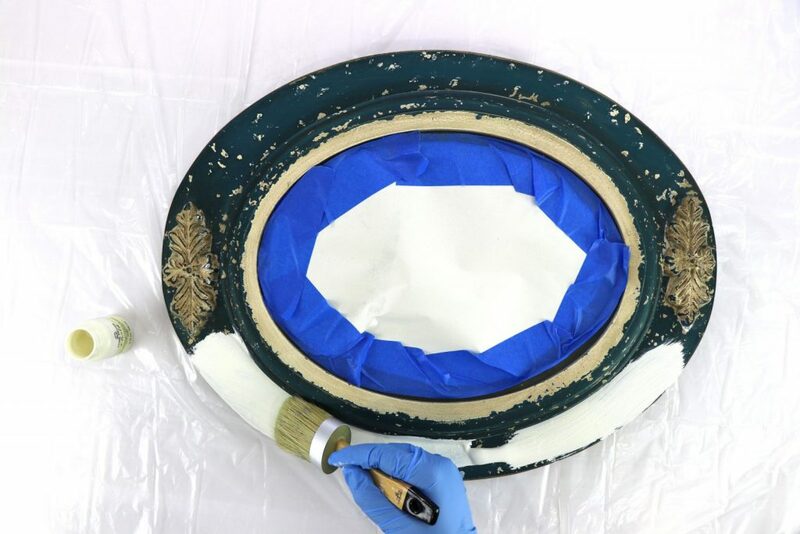 After you paint on the next layer of paint, you can see the crackles begin to form. If you want a more distressed look, take some sandpaper and sand away some of the top finish. 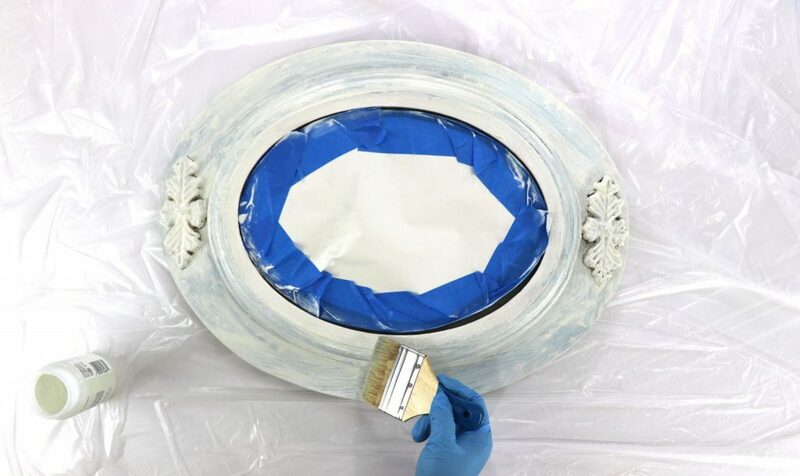 You can also add some more paint or a distressing medium to fill in some of the cracks if you want that kind of look. I wanted a very subtle worn look to this project. But I wasn't that excited about the clock's very “farmhouse” grey color … I needed more POP for this clock to work in my bedroom. So we added stripes! Dragging round paintbrushes in various thicknesses around the edge of the frame, we painted on stripes. These imperfect stripes give the clock frame a touch of whimsy. And hand-painting allow the brush to glide over the crackled areas, allowing the subtle texture to show through. 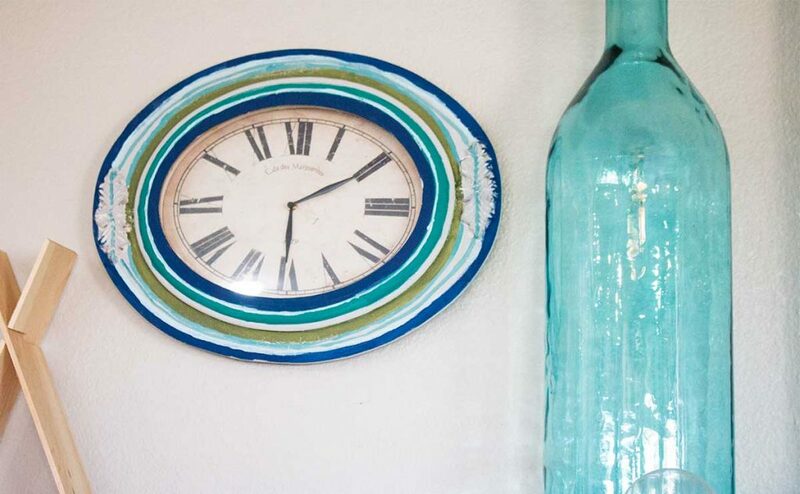 This clock now feels bohemian, it's colorful, and it feels well-loved. It's perfect for our modern bedroom, with a touch of Jungalow … *wink wink*. To get a better photo, we displayed the DIY bohemian style wall clock on our mantel in the living room. I'll be bringing this clock into my bedroom to hang by my fiddle fig plants soon! 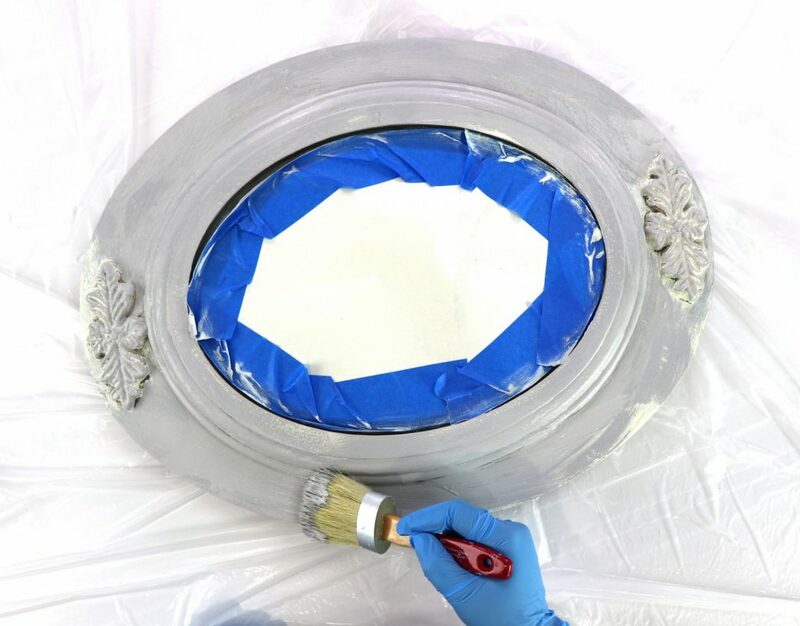 Once you've finished painting, you can seal the finish with wax or varnish. We chose to leave this project unsealed but I'd choose white wax for a sealant. I love the bright finish that white wax gives especially since my house isn't super country and a dark or more distressed finish wouldn't really look good in my space. Do you have at home decor piece that you used to love but that now needs a new life? Try painting it like I did. The worst thing that will happen is that it looks terrible. I know that sounds crazy but I'm telling you this because if it looks bad now and it looks bad when you're done painting it while you're still at square one. So no biggie. You can always give it to the thrift shop where somebody else will find that gem and make it into something amazing. Yes! We are firm believers in – if you don’t love it, change it! So glad you pulled this from the garage sale pile and gave it a makeover. Love the brighter colors and new finish! Way to salvage what you already have with an update and keep it from going to the pile of no longer used stuff like I have going on. We are definite believers in changing what we don’t like in our own homes. So glad that you pulled this from the garage sale pile. Love the new look! Your daughter did a great job on the popcorn ceiling clock 🙂 I love a little bit of bohemian mixed in. 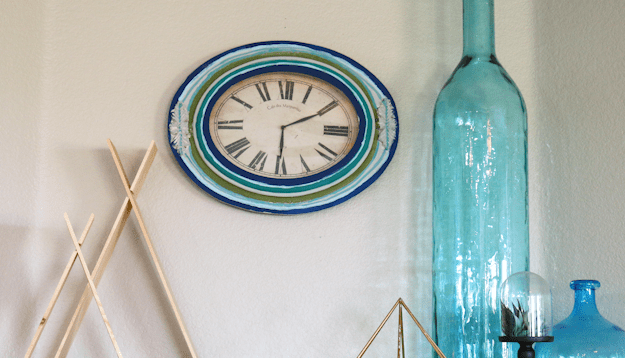 Your wall clock redo turned out beautifully and definitely very Boho! I love when you can recreate something that you already have instead of just getting rid of it. I love the colors that you used and clocks are a fav!! I have never been afraid to slap some paint on something! Your bohemian wall clock looks funky and fun!